MO Books: "The Harley-Davidson Story: Tales From The Archives"
Gee, you don't look a day over 100! 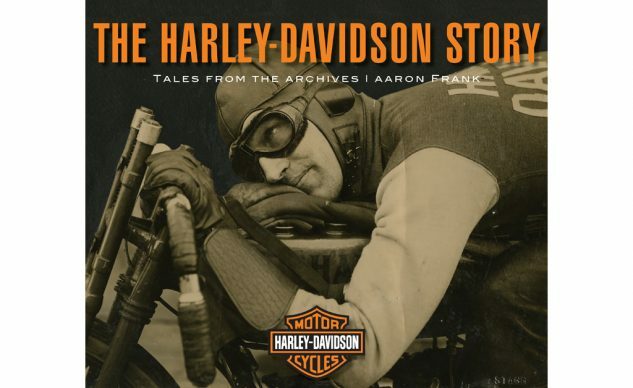 Ex-Motorcyclist staff writer, current Milwaukee-residing advertising man, and all-around good guy Aaron Frank’s new book puts an interesting twist on telling the tale of Harley-Davidson. 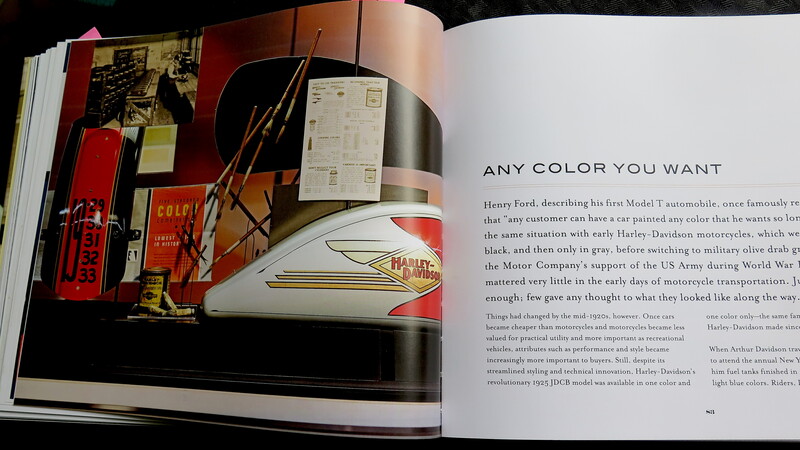 Rather than rehashing the history of all the models – though there’s a bit of that here for all the major updates – Frank worked in cooperation with the H-D Museum in Milwaukee to look back through the lens of the museum’s holdings and displays. It makes sense, since the museum staff has already gone through the painstaking work of winnowing God-knows how many H-D artifacts into what will fit in a 130,000-square foot building. Buildings. 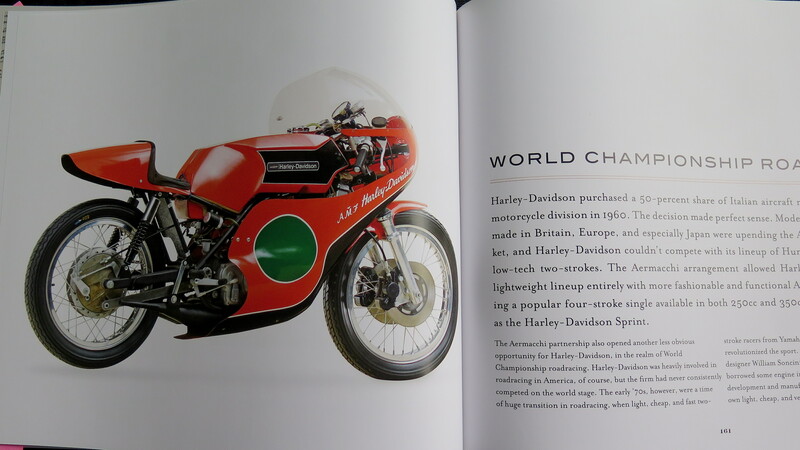 If you’ve been to the museum, you’re already familiar with what a lot of fascinating objets d’ Harley, and Harley people it contains. 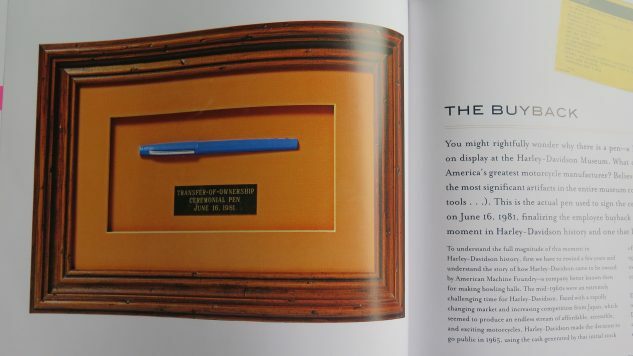 The foreword is by Jim Fricke, the museum’s Curatorial Director. With that kind of cooperation, you shouldn’t expect to read much about some of H-D’s less glorious moments: There’s plenty about early racing successes and Aermacchi, and XR750 – but no mention of Buell, MV Agusta or the VR1000 escapades. Still, there’s a lot to sink your teeth into. For instance, everybody’s heard of the tragic crash at Monza that killed Renzo Pasolini and Jarno Saarinen, but I was not aware that Pasolini was riding for Factory Harley-Davidson at the time. The RR-250 used some Yamaha TD internals, says Frank. Pasolini finished second on it in the 250 GP World Championship in 1972. Hopes were high for ’73, before the deadly crash at that year’s Italian GP. 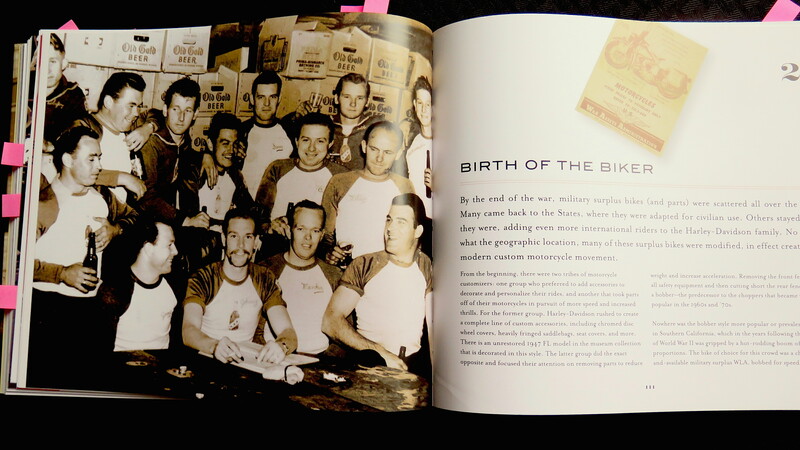 The counterculture that sprang up after WW2 can’t be ignored, even though H-D at first battled bravely to distance itself from clubs like the Boozefighters. “Well-dressed motorcycle riders on shiny, good-looking motorcycles are likely to stay out of trouble. Riders dressed in overalls, on motorcycles that are stripped down and generally dilapidated, are all dressed up for trouble and likely to find it,” said one speaker at a 1947 dealer conference. It was the war and the glut of cheap surplus Harley WLA military bikes that created modern H-D biker culture. That and Marlon Brando in the movie these guys inspired. 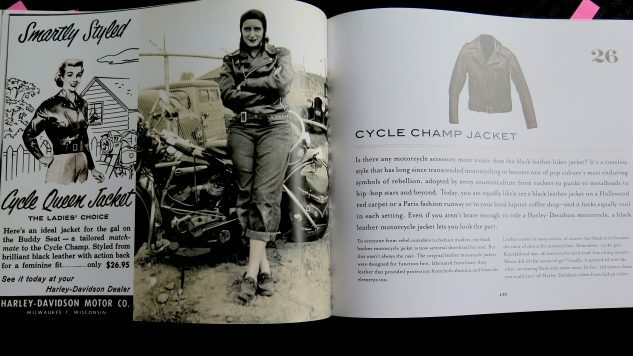 So, if you can’t beat ’em… Motor Clothes are not a new thing either. It’s always been important to look the part, and the black leather jacket is almost the club uniform to this day. Why black? To hide the oil. Supposedly at one time, you could tell an Indian rider from an H-D one by which side of the back of his jacket the chain oil was flung upon. For many years, just getting you to your destination was all riders asked of their motorcycles. Harleys were all black, then gray, then olive drab beginning in 1917 and all the way to 1932. When the Ford Model T came onstream for less than the price of a Harley, style suddenly became way more important. 1933 was a dark year for Harley. In 1934, they began offering standard two-tone paint, optional hand-painted pinstripes and art deco-inspired logos – and experienced a 300% increase in sales. The paint brushes seen here belonged to John Jung, one of Harley’s hand painters beginning in the ’30s. Today, the “Tank Wall,” with a hundred tanks from the last 100 years, is one of the museum’s most striking exhibits. The exciting new Knucklehead of 1936 had all the dealers panting, but nearly didn’t get released because it leaked oil so bad. A last-minute revision involving new valve stem covers and vacuum-operated breathers cured it just in time. Here, Arthur Davidson, Walter Davidson, William Davidson and William Harley inspect one of the first new EL models to roll down the assembly line. Hard times-wise, H-D’s current downturn can’t hold a candle to the Great Depression. 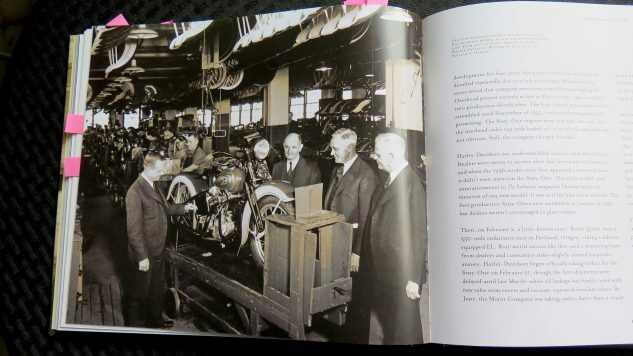 H-D sold 29,000 bikes in 1929, and 3,700 in 1933. The EL was the bike that brought them back from the dead – and back to over 11,000 sales in 1937. 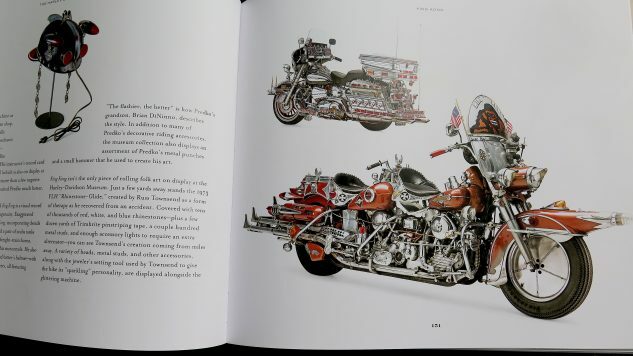 No Harley book would be complete without a custom or two would it? King Kong packs two Knuckleheads into a single 13-foot long cruiser complete with stereo and plenty of room for two. 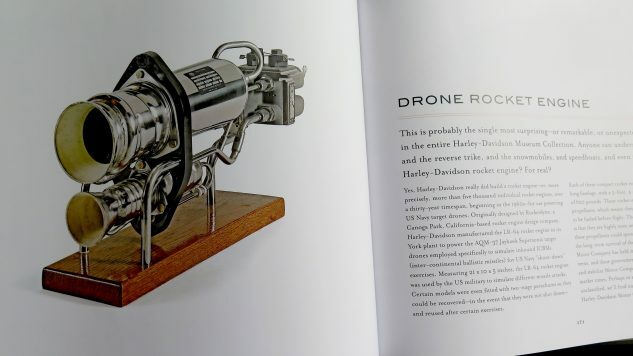 Did you know Harley produced over 5000 rocket engines to propel US Navy target drones? Designed by Rocketdyne, Harley cranked these out in its York, Pennsylvania, plant. All part of H-D’s long-standing military collaboration. Uncle Sam almost always pays his bills. How about the pen used to sign the contract that bought Harley back from AMF in 1981? Fittingly, it’s a blue Paper Mate Flair felt tip. By now you get the idea. There’s a lot going on in the museum. Aaron’s narrowed it down to 45 chapters in 216 thick semi-gloss pages, and done a great job fleshing out each chapter to let each object tell its unique story – human as well as material. There are great chapters on Otto Walker (that’s him on the cover), Joe Petrali, Vivian Bales, et al. We do creep a bit into cheerleading for the brand (not sure if the Livewire and new Fat Bob are worthy of inclusion just yet), but not too heavy-handedly so. This tasty tome is definitely worth a spot on the bookshelf of any Harley or American history student who still has a bookshelf, and suitable for the coffee table if you haven’t. Get price quotes for Harley-Davidson from local motorcycle dealers.